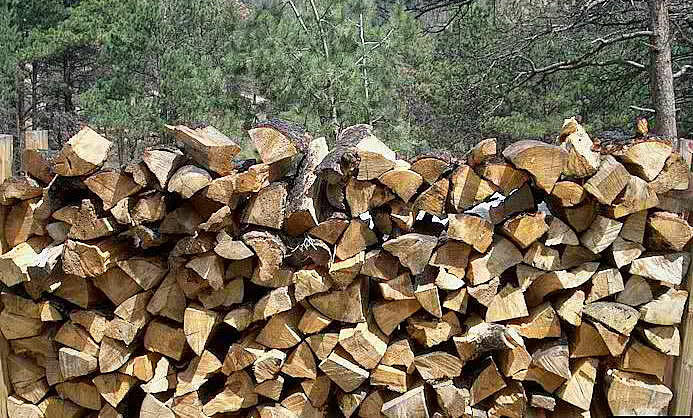 If you have a wood burning fireplace or heat with a wood burning stove, how’s your firewood supply? If it’s low and you’re shopping for a firewood supplier, these tips are for you. The first tip is to buy locally. Regular readers know that I firmly believe that buying locally is best, especially for plants. But, when it comes to firewood, I’m even more adamant. And, I’m backed up by the law on this one. In New York State, it’s against the law to transport untreated firewood more than 50 miles from its source or import it into the state. Also, firewood sellers are required to provide you with source documentation for the firewood they sell. This is to minimize the migration of deadly, invasive insects like the emerald ash borer and Asian longhorned beetle. Even with the law in place, I’ve seen truck and trailer loads of ash wood going down the street. However, I urge you to obey the law, especially if you have ash trees in your yard. Treated wood is defined as having been heated to 160ºF for 75 minutes. It can then be labeled as “New York Approved Treated Firewood/Pest-Free” by the producer. Even if you cut and transport your own firewood, you cannot legally transport it more than 50 miles or bring it into the state without a “Self Issued Certificate of Origin,” which can be downloaded at http://www.dec.ny.gov/docs/lands_forests_pdf/selfisscert.pdf. A second tip is to be sure you know how much wood you’re buying. While we usually see ads for face cords, that’s not a legal measure. Your receipt or bill of sale needs to list the fraction of a cord you bought. A cord, which is 8 feet wide by 4 feet high by 4 feet deep, is a legal measure. A face cord that is 12 inches deep is a quarter cord, and that’s the way it needs to be sold. A third tip is to be sure the wood is seasoned and, preferably, hardwood. Green wood doesn’t burn well due to its high water content. Green wood is tan in color, while seasoned wood is more of a gray color. Hard wood is preferred because soft woods have more resins and impurities like creosote that can adhere to your chimney walls and start a fire. That old rule of thumb that says if a deal looks too good to be true it probably is applies to firewood. Unlike many such deals, however, buying undocumented firewood can result in legal problems as well as an insect invasion of your valuable, standing trees.